The true attitude is this: money is a force intended for the work on earth, the work required to prepare the earth to receive and manifest the divine forces, and it—that is, the power of utilising it,—must come into the hands of those who have the clearest, most comprehensive and truest vision. There are many ways to collaborate. You can offer your time and your skills, your talent and creativity that could help. Please get in touch with us for exchange of views here. We shall be glad to hear your views and to answer your queries. 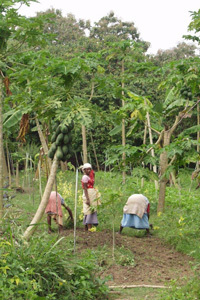 One of the essential requirements is the funding resource for purchasing the lands. According to the vision of Sri Aurobindo and the Mother, money is a force meant to organize human life in such a way that it paves the way for a new and transformed world. 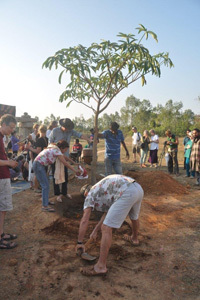 Auroville, too, is attempt to organize human life in such a way that it prepares for a new and transformed world. 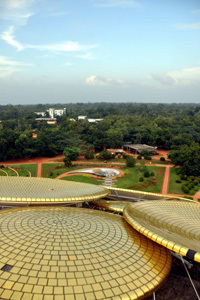 Hence, in our view, a financial contribution to Auroville is a contribution to the future of humanity. Together, they are united and complementary actions for the totality of the Township’s Masterplan area. It hardly needs to be mentioned that a unified and coherent land base will allow a harmonious development of the City of Dawn. We invite your support for the campaign that touches your heart! If your circumstances allow you to make financial contribution, please click here.